Hi, my name is Nathan and I’m the owner and writer of Masters-of-Music.com. I started this website because I’ve always loved music. I’ve been playing guitar since I was a teenager and I like playing drums too. I recently decided to start taking music more seriously, to learn new techniques and learn how to get into home recording. I wanted to create a website where I could document everything I learn along the way, and to have everything in one centralized place for easy reference. Writing things down helps me remember details better, so I figure why not share the information along the way. To be clear, I am not a “Master of Music” by any stretch of the imagination. This website was mainly started to highlight other professional musicians and all the great tutorials that are on YouTube. Plus “Amateurs of Music” doesn’t quite have the same ring to it. This website is a place to learn about anything related to music creation and production, with an emphasis on tutorials for things like guitars and drums and how to use various software plugins to get the most out of mixing and arranging new songs. Masters of Music is also a place to catch up on new hardware and software releases, along with occasional reviews, free DAW plugins, and other useful tools and tips. One thing you can always be sure of about this website is the opinions and reviews will always be honest and unbiased. I don’t have any problem telling it like it is because I don’t have any allegiance or interest in any particular brands, and I only post reviews of stuff that I actually use. This website is funded mostly through Adsense and Amazon affiliate links, not through sponsorships, so I don’t give a crap what brand of gear you choose to buy or if you buy anything at all. 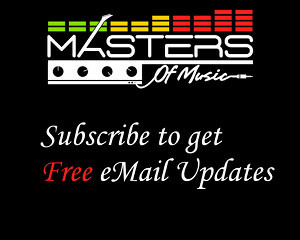 You can keep updated on all the new articles added to Masters of Music.com by subscribing to our RSS Feed or you can get emails delivered via Google Feedburner. If you any questions or comments or just want to get in touch with me about anything related to this website, the easiest way is to leave a comment on any of the articles. If you don’t want the comment to be shown publicly just say so and it will be deleted and I’ll send the response to the email address that you leave. If you’d rather send an email just use my first name @ this website’s domain name. I already get bombarded by enough spam so I don’t want to post the address here where robots will pick it up. Masters of Music and its owners cannot be held responsible for any losses or damages incurred from the information on this site. You are free to use the information described on this website at your own risk in a reasonable and responsible manner. It is your responsibility to read the terms and conditions of each product described here before using. Here at Masters of Music.com we purchase the vast majority of products reviewed on this website, but occasionally receive free merchandise for reviewing some products. Regardless of this, all reviews on this site are as unbiased as possible, listing both positives and negatives of a specific product so that you, the consumer, can decide which is best for your specific needs. Masters of Music.com receives affiliate commissions from various affiliate links posted throughout this website through Commission Junction, SkimLinks, Amazon Associates program, and others. Whenever someone clicks on an affiliate link and then purchases something from that company, Masters of Music.com receives a small percentage of the sale, depending on the product. This, along with Adsense and advertising, is how this website generates enough money to cover costs to keep this site up and running. “Ads by Google” are random advertisements controlled by Google, so if you see a Google ad and a Web page about the same product or service, it is a coincidence.